It is doubtful that President Obama would give up his trusty BlackBerry for a BlockBerry 9500. Still, you have to laugh at the absurdity of the situation when an obvious knock off of a legitimate phone has a major feature in it that the original has left out. We're talking about Wi-Fi which the BlockBerry offers. The Storm knock off is powered by WindowsMobile 6.1, is equipped with a 3.2 inch touchscreen display, FM radio and GPS. The BlockBerry 9500 is offered in 6 colors and has 3G/EDGE connectivity. The caption that is included with the picture of the President reads "Obama has BlackBerry, I have BlockBerry," And if you have BlockBerry, you have Wi-Fi, with the real Storm...not so much. This looks like a pretty kool knockoff...i wonder how reliable this unit really is though?? It's not anti-verizon, from what I can tell. You mean they didn't put all the iPhone knockoff's up? Go back to the funky bunch, kid. It looks like they copied HTC's TF3D. 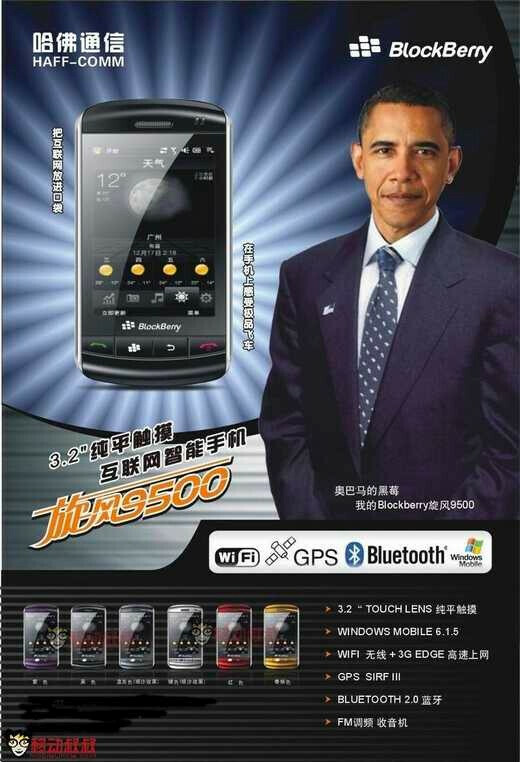 ROFL a fake BB on the market using Obama as a marketing LMAO, is there anything funnier than this?